Call for DebConf11 attendance - OMG! Ubuntu! 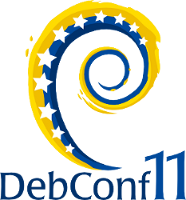 After last years Debian Developer�conference�in NYC (DebConf10) this years conference, DebConf11 will be held in Banja Luka, Bosnia and Herzegovina from 24th to 30th July. Of course besides developers, among the attendees you’ll be able to see many well known faces from Open Source/Linux world, as well as representatives�from some of the leading companies from this sector. We believe this conference will put whole Balkan on a map of Open Source/Linux world and will reveal some new horizons for this whole region. There’s no registration or attendance fee – all that is required of you to enjoy the lectures/presentations or hack labs is to register. In order to register, you don’t have to be a Debian Developer, nor even a Debian user for that matter (Hello Ubuntu users :)) of course your participation in any of the Open Source/Linux projects will only benefit your application for your travel/accommodation/food sponsorship. Besides lectures and�similar�activities, we’ve made sure there’s bunch of fun activities such as dinners, wine & cheese parties,�day trips, rafting and even a privately held concert for all attendees. Period for sponsored registrations will be open until 8th of May, after which you’ll still be able to register but will personally have to take care of your food and�accommodation. Registration for professional category is�450� while corporate�is 1000� and will be open after 8th of May. Once again,�I’m inviting you to be a part of something that will make Banja Luka the center of the Linux world. See you in Banja Luka!